Some gardeners have a dirty little secret that they don’t want anyone to know about. They think they are hiding it well, but one look around their garden and it is obvious. They don’t have compost bins or any means to compost the refuse from their garden. I don’t know what they do with all their plant clippings and leaves and apple cores and leftover jack-o-lanterns, and I’m too polite to ask. But I won’t judge them, either, because each gardener has their own circumstances and must live with their own actions. Embrace composting for a happier gardening life. Some gardeners think that composting is a lot of work. There’s all that talk about turning the piles, after all, which involves a pitchfork or shovel to “turn” the compost, usually by digging the compost out of one pile and onto another. Some gardeners think that composting is complicated. It sure sounds complicated when you read about the “proper” ratios of green (wet) matter and brown (dry) matter. And then there are compost starters for sale at the garden centers. How much of that do you need? And what if the pile is too wet. Or too dry? Some gardeners think that compost piles are ugly and that they smell. They think it looks like a pile of debris and wonder what the neighbors will think if the wind blows the wrong way. Well, forget all that, none of it is true! Composting doesn’t have to be a lot of work. You can add to a pile and just let it sit without turning, if you’d like, and eventually, you’ll have compost. It may not be as fast as you would get compost if you occasionally turn the pile, but that pile will eventually break down into compost. Composting isn’t complicated. You can just pile up whatever you have from your garden, “greens and browns”, with no store-bought compost starters, and you’ll eventually get compost. Composting doesn’t have to be ugly and it shouldn’t smell. 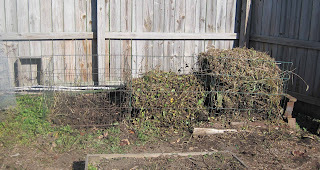 You can put a screen around the compost pile to keep it from being seen or purchase a tumbler or other plastic unit and hide it behind a big shrub. And if the pile is getting enough air and isn’t full of stuff that shouldn’t be in a compost bin anyway, it won’t smell. I spent today embracing composting! 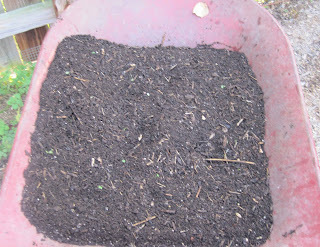 I started out early this morning harvested the compost that had miraculously appeared since the last compost harvest. This involved removing the uncomposted debris from the top of one pile, then shoveling out the compost underneath. I used a homemade compost sieve to screen out some of the uncomposted debris in some of it, (screened compost pictured above) but as I dug further down into the pile, I found I didn’t have to screen out debris as much. Then I put the uncomposted “stuff” back into that empty bin and proceeded to fill it with uncomposted debris from the second pile, and repeated the process of harvesting compost from that second pile. Then I moved on to the third pile and did the same. Now I’ll just leave the compost bins for the winter, adding whatever kitchen scraps I have leftover that I can’t use in the worm bins in the sunroom and let compost happen. You've got a good set up. My problem with composting is that tree roots tend to invade the pile because I don't turn it. Yes, I'm a lazy composter. I'm impressed, I don't even use a sieve when I harvest. I just mix the compost with some other soil so it stops being hot and eventually it all decomposes. I agree, though, it's definitely fun. Compost happens! I can honestly say that composting has been one of the most enjoyable things I've done in my gardening life. There are gardeners who don't compost? Horrors! I've just pulled a large garbage bin (with lid) onto the deck so that when the snow gets deep this winter we can at least store the compost outside without having to shovel a path to the far side of the yard. I don't want to waste all those wonderful nutrients in our leftover food and coffee grinds! We have a small yard and garden - but no matter what size a compost bin is a huge plus! We have small maybe 4 foot high plastic compost kit we found on Craigslist for 50 bucks but before that we used an old trashcan that we drilled holes into for ventilation. I feel so good to be dumping our scraps and yard waste into a compost pile that in turn adds to the beauty of our yard as fertilizer later in the year instead of adding it the trash can. And so much can be composted! Cardboard paper towel tubes, dryer lint, coffee filters, tea bags - so much saved instead of going into the landfill! I was impressed with out first year - the compost never does smell like trash. Instead it has an earthy odor - not unpleasant. I have two bins made from concrete blocks just placed on the ground and as one bin needs higher walls, the other can make do with lower because the stuff's broken down a bit, so I shift the second level of blocks about. It takes a time to compost here, mainly because I don't water it enough in the summer, but we get there eventually. And the people that don't compost can't hide the bags of leaves they put out on the curb. I just steal their leaves, the nitwits. You have the best compost set up! I spent big bucks on fancy compost tumblers and I've found methods that allow compost to get plenty of air and water works best. I do think, however, that composting does take some patience. As a hort prof said recently, "I am good at making piles, but not so good at turning them." Good point that with patience comes compost. My compost pile is a member of the family. When my husband is about to absentmindedly throw an apple core or banana peel in the trash, I remind him to "feed Mr. Compost," i.e. a bucket for garbage under the sink. I've noticed that the healthier we eat, the faster the bucket fills, and the more often I have the satisfaction of feeding the pile. Great post! I wrote one similar to it early this spring and posted pics of mine. post and has a great reason: BEARS!! The wreck EVERYTHING! Having a convenient chipper definitely makes composting go faster. I'm a lazy composter--I dump everything in a pile behind a shed where no one can see it and then do nothing to it. But even so, eventually there's some wonderful "black gold" that eventually appears under all that debris. Nothing like free fertilizer! Carol -- Can you describe your homemade sieve for the compost? I'm curious as to what you use to ensure the big stuff goes back in the pile.